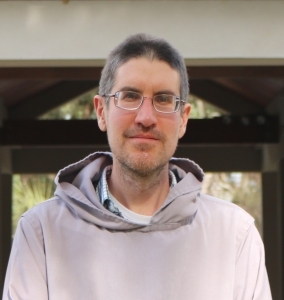 When I came across the Mepkin abbey website I noticed their banner saying “be a monk for a month – any faith is welcome,” and I thought what a fantastic idea. I would love to try that out. Fr. Jonas was quick to get back to me when I applied and before long I was in the choir stall singing with the monks, doing mushroom farm, and really living as a South Carolina Trappist monk. I felt right at home. I had my own room with a bathroom. I had access to the library, laundry, gym. I had everything I needed. They even served vegetarian food, which was exactly how I normally ate. I quickly fell into the routine of things and the community was there to help. Fr. Jonas was always available when I had questions. Br. Juan and Jimmy showed me everything I needed to know about mushroom farming. Br. Francis and Br. Justin were there to lend a helping hand to show me where the next song or response was. Br. Paul was there to cut my hair. Fr. Richard took the time to show me his Greek and Latin New Testament. Truly it was a community based on love and serving. In the end I took away a number of spiritual treasures. 1) The regular use of the Psalter, the importance of appearing before God throughout the day in prayer. 2) The value of reading scripture every day and reflecting on it. 3) The joy of the Eucharist and the daily mass. 4) The blessings of the rosary. I pray that I might continue these disciplines back in the world.